PFV (Photron FASTCAM Viewer) software had gained many fans over the years for its robustness, reliability and ease of operation. With the release of several new cameras, specifically the super-fast FASTCAM SA-X, FASTCAM SA5 and multi-head FASTCAM MH4, PFV has been given a face lift and major overhaul to improve its functionality and give it a fresh new look – introducing PFV3. 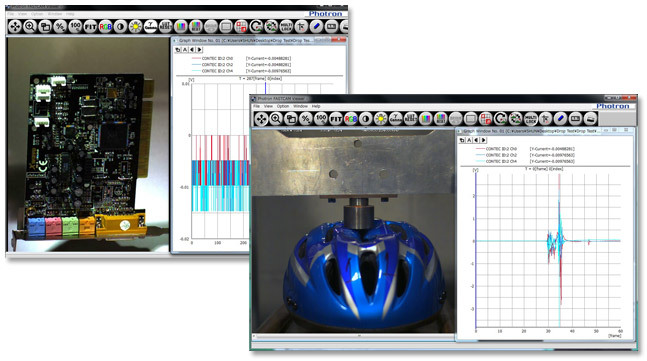 PFA has been designed to be used as a powerful optional motion analysis accessory for our Photron FASTCAM Viewer (PFV), the camera control software for FASTCAM cameras. FASTCAM NI DAQ Software Option is designed to synchronize Photron slow motion cameras with the bestselling M Series integrated BNC Data Acquisition (DAQ) units from National Instruments ™. The NI USB-6251 BNC provides eight differential analog channels (16 Single Ended) with an aggregate one million samples per second data rate. The optional NI USB-6251 BNC is controlled by the Photron Fastcam Viewer (PFV) camera control software and enables simultaneous recording and playback of both analog data very precisely synchronized with high speed video sequences recorded anywhere from 60 to 1.5 million frames per second (fps).